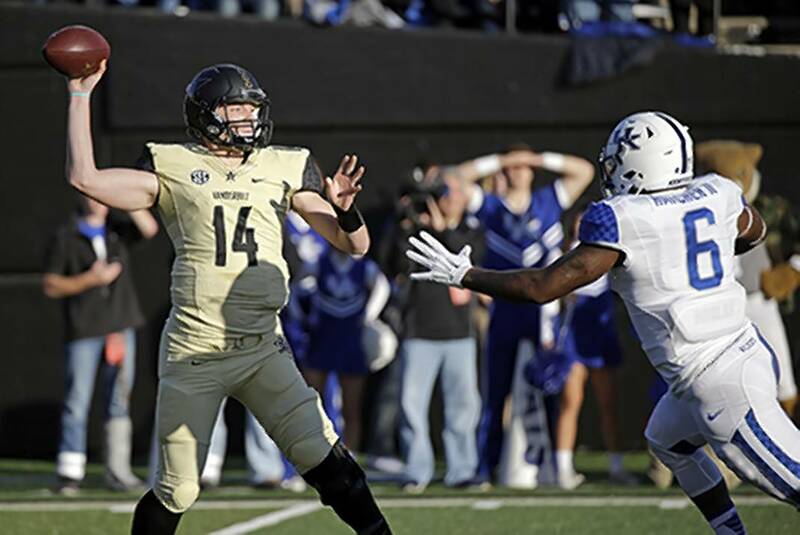 Vanderbilt quarterback Kyle Shurmur played in five games last season as a true freshman, completing 44 of 103 passes for 503 yards with five touchdowns and three interceptions. HOOVER, Ala. — Vanderbilt's quarterback position has been a revolving door of injuries and uncertainty in the Derek Mason era, but the third-year coach of the Commodores has tabbed sophomore Kyle Shurmur as his guy for 2016. "Toward the end of last season, you saw a young quarterback by the name of Kyle Shurmur step on the field and play meaningful football games, and that's important," Mason said Monday as SEC media days opened. "I've named Kyle the starter, and that's where we are. He showed great character and leadership in the offseason." The Commodores have won just two conference games under Mason, and Shurmur was the starter for each. Vanderbilt topped Missouri (10-3) and Kentucky (21-17) behind the 6-foot-4, 225-pounder from Philadelphia, who ended last season by throwing for 209 yards and three touchdowns in a 53-28 loss to Tennessee. Backing Shurmur on the depth chart are junior Wade Freebeck, sophomore Shawn Stankavage and true freshman Deuce Wallace. "Kyle played at the end of last season and didn't get to showcase that much of what he can do," Commodores junior inside linebacker Zack Cunningham said, "but he has really stepped up as a player. I feel like he's going to be one of the quarterbacks to watch out for coming into this year." Treon Harris, Florida's starting quarterback for the second half of last season, and Antonio Callaway, who had a team-high 678 receiving yards for the Gators and was the hero of last September's 28-27 win over Tennessee, were suspended before spring practice for violating team rules. They have yet to get cleared to play this season. "They are back on campus, using the academic center and working out," Florida second-year coach Jim McElwain said, "and yet nothing has been resolved yet. There really isn't a timetable on it, so that's about what it is right now." Harris was moving to receiver before being suspended. Auburn underwent a surprise change in February when Dameyune Craig, who quarterbacked the Tigers to their first SEC title-game appearance in 1997, left his post as receivers coach for the same position at LSU. "I was really close to Coach Craig," Auburn senior receiver Marcus Davis said. "He's a guy who recruited me and believed in me and gave me a shot. He's a guy who the receivers at LSU are going to love. He's a positive role model who played in the SEC, so it's going to be great for those guys." Craig was replaced by Kodi Burns, who was a receiver on Auburn's 2010 national championship team that had current head coach Gus Malzahn as its offensive coordinator. Georgia defensive end Jonathan Ledbetter will undergo counseling and enter a medical assistance program in the wake of his DUI arrest early Sunday morning in Athens. The 6-4, 251-pound sophomore was asleep at the wheel and blocking traffic, according to the police report. He also was arrested in March for underage possession and for possessing false identification, though those charges were later dropped. "Certainly we are disappointed and recognize he has a serious problem," Bulldogs first-year coach Kirby Smart said in a released statement. "We have provided help for him previously, and we are committed to providing whatever assistance is necessary for Jonathan that will contribute to immediate improvement but also ensure that his long-term well-being is secure." Said Ledbetter: "I have a problem and have received an incredible amount of support and treatment through the athletic department for the problem. For that I am thankful." League commissioner Greg Sankey said Monday the SEC Network had 1,600 live telecasts during the 2015-16 school year after a debut year with 1,000. Nick Saban will be making his 15th SEC media days appearance Wednesday (five with LSU and 10 with Alabama), which will match Phillip Fulmer and Mark Richt for the second-most in league history behind Steve Spurrier's 23. Mississippi State announced Monday that senior safety Deontay Evans, who had 85 tackles and a forced fumble in his career, intends to transfer. Florida safety Marcus Maye on Georgia starting Faton Bauta at quarterback in Jacksonville: "I don't know why they did that."